Florida’s sunny weather and countless miles of beaches makes it a great place to ride a bicycle. With Florida’s population constantly on the rise, so too is the traffic and the lack of parking. Sometimes riding a bike is the most convenient and economical form of transportation. Regrettably, riding a bicycle can also be very dangerous. If you or someone you know was injured and in need of bicycle accident lawyers in Naples, Florida, please call the Law Office of Verderamo & Escobar at (239) 775-1004 for a free consultation. What to do if involved in a Florida bicycle accident? First, contact law enforcement and seek appropriate medical treatment. Obviously, your health is the most important thing and following a bicycle accident, you should be evaluated by a medical professional as soon as practical to ensure that you are not seriously injured. It is also imperative that you report the accident to law enforcement immediately. Usually, law enforcement is the first to arrive on scene and will investigate the accident and generate a report. They will sometimes gather evidence, witness names and take down the other driver’s information. This is crucial if you are going to seek compensation from the other driver at a later date. If you are physically capable, you should attempt to take photographs of the scene and of the vehicles involved. If the accident was caused by a defect on the road or sidewalk, take photographs of this as well. This is important because vehicles and road defects are sometimes repaired following an accident. Consult with experienced bicycle accident lawyers as soon as possible. The immediate moments, and even days, following a serious accident can be very stressful, painful, and confusing. They are also the most crucial in terms of securing the necessary evidence and witnesses for an accident case. An experienced bicycle accident attorney will know what information is most important and will hire private investigators and expert witnesses for the case. Contact your insurance company and report the accident. Some bicycle accidents are covered under Florida’s No-Fault Laws. This means that Personal Injury Protection (PIP) may apply. Also, if the at-fault driver left without providing his identification and insurance or if the driver did not have insurance or sufficient insurance to adequately cover your injuries and expenses, then you may be able to utilize your uninsured/underinsured (UM) policy if you have one. Either way, most insurance policies require policyholders to notify insurance carriers soon after the accident so it is wise not to miss these important deadlines. In Florida, bicycles are considered vehicles under Florida Statute. While bicycles are not considered motor vehicles, they do fall under the definition of “vehicle” and, as such, they have “all of the rights and all of the duties applicable to the driver of any other vehicle” under Florida law (with some limited exceptions). Being that Florida is a comparative fault state, the amount of compensation recoverable for a bicycle accident will be reduced by the percentage of fault attributable to the injured cyclist. Basically, it reduces how much an accident case is worth. Below you will find some of our most frequently asked questions and answers based on the rules regulating bicycles according to Florida Statute. Keep in mind that there may be additional local ordinances in your city, town or county that further regulate the use of bicycles. 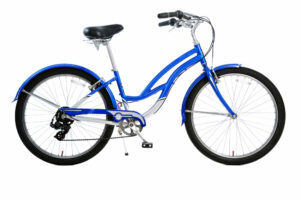 Can I sit on the handlebars of a bicycle in Florida? No, according to Florida Statute 316.2065 a person operating a bicycle must sit upon or “astride” a permanent and regular attached seat. Further, a bicycle may not be used to carry more “persons at one time than the number for which it is designed or equipped, except that an adult rider may carry a child securely attached to his or her person in a backpack or sling.” Otherwise, children under four (4) or who weighs 40 pounds or less, must be in a seat or carrier that is designed to carry a child of that age or size and that secures and protects the child from the moving parts of the bicycle. Do I have to wear a helmet on a bicycle in Florida? If you are under the age of 16 and a passenger or a rider, you must wear a proper fitting approved helmet. This includes children riding in a bicycle trailer. However, the use of a helmet is always encouraged to help prevent serious injuries such as traumatic brain injuries. Can I be towed behind a vehicle while on a bicycle? No, according to Florida Statute 316.2065(4), no person riding upon any bicycle, coaster, roller skates, sled, or toy vehicle may attach the same or himself or herself to any vehicle upon a roadway. Can I ride my bike on the roadway or must I ride in a bike lane? 3. When reasonably necessary to avoid any condition or potential conflict. These would include, but not limited to, a fixed or moving object, parked or moving vehicle, bicycle, pedestrian, animal, surface hazard, turn lane, or substandard-width lane, which makes it unsafe to continue along the right-hand curb or edge or within a bicycle lane. Florida Statute further indicates that if riding a bike on a one-way highway with two or more marked traffic lanes, the rider may ride as near the left-hand curb or edge of the roadway as practicable. Do I need lights on my bicycle? Yes, between sunset and sunrise, all bicycles must have a forward lamp emitting a white light that is visible from 500 feet away and a rear lamp and reflector exhibiting a red light visible from 600 feet to the rear. Although not required, it is recommended that the bicycle have additional reflectors that are visible from the side. What rights or duties does a bicycle rider have when on a sidewalk? A person riding a bicycle on and along a sidewalk, or across a roadway upon and along a crosswalk, has all the rights and duties of a pedestrian under the same circumstances and must yield the right-of-way to any pedestrian; providing an audible signal before overtaking and passing pedestrians. Is there a requirement that Florida bicycles be equipped with brakes? Can the failure to wear a helmet be considered as evidence of negligence or contributory negligence? No, according to Florida Statute 316.2065(18), it cannot. How much space should a motorized vehicle afford a bicycle when passing? Obeying Florida’s laws on the use of bicycles is a good way to try and prevent accidents. Not everyone is aware of these rules. Many motorists incorrectly believe that bicycles have no place on roadways and either fail to properly yield to bicycles or, much worse, purposely harass and threaten cyclists. A bicycle accident fatality can lead to a wrongful death case. Bicycle accidents are similar to motorcycle accidents in the sense that the rider is exposed during a crash. For this reason, many of these accidents result in fatalities, especially if a motor vehicle collides with the rider. As accident attorneys in Naples, Florida, we have seen how devastating a bicycle accident fatality can be on a family. This type of death is one of the most difficult to endure because it means that a person’s life was taken away suddenly and before their time; oftentimes, without the chance to say goodbye. For those left behind, it may mean the loss of support, companionship, instruction, and guidance and will likely result in mental pain and suffering. For these survivors, there may be the potential for recovery under a wrongful death case. If you’ve been injured riding a bicycle as a result of a road defect or negligence by another cyclist or motorist, do not hesitate to contact the Naples bicycle accident lawyers at the Office of Verderamo & Nunez in Naples, Florida at (239) 775-1004.